There are two secrets you must protect in order for this effect to be a miracle: first, that the second deck is in order; second, that you know the identity of the spectator's card. 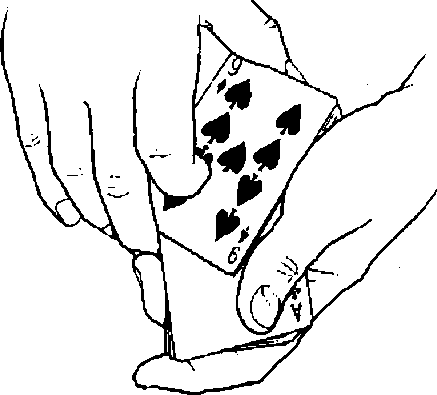 The keys to protecting the first secret are a convincing false shuttle and the fact that the audience sees the random order of the cards as the spectator deals them in a face-up pile. Protecting the second secret is just as important. In Magic and Showmanship, Henning Nelms talks about what he calls the conservation principle. The essence of the concept is that you shouldn't always show your full hand. This can be a hard lesson to learn. It's natural to want to include every possible climax, reveal every piece of knowledge, and squeeze every potential drop of magic out of a trick. It's easy to fail to realize that, in magic effects, there are many situations where adding a part weakens the whole. In Remote Control, you may be tempted to announce the name, of the spectator's card as well as its location. Resist this temptation. You may think it adds more magic to the effect. You may think you're providing the audience with an additional mystery. In fact, you're only providing a clue to the solution.